Warhorse, potboiler, over-the-top – words often used to describe Verdi’s Il Trovatore. One of the most parodied of operas, the Marx Brothers had a field day with it in A Night at the Opera, as did Gilbert and Sullivan in The Pirates of Penzance. Il Trovatore is one of the three most popular operas in Verdi’s “middle period”, the others being Rigoletto and La traviata. 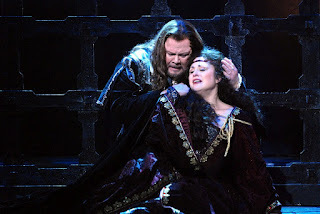 Based on statistics from the Operabase website which maintains attendance figures worldwide from 2005-2010, Il Trovatore ranks 5th in popularity among 29 operas by Verdi, who in turn tops the list as the most frequently performed opera composer with a totally of 2259 performances, beating out Mozart, Puccini and Wagner. Detractors of Il Trovatore love to poke fun at its outrageously improbable plot, “oom-pah-pah” orchestration, stand-and-deliver principals and one-dimensional characterizations. 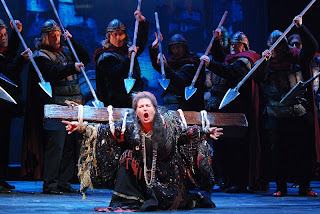 Indeed Il Trovatore has everything but the kitchen sink – a love triangle, mistaken identity, kidnapping, filial piety, revenge, murder, poison, suicide, burning at the stake, beheading – you get the general idea! So, a performance of this opera is really a fun night at the opera. On the opening night of Opera Hamilton's stab at this piece on Saturday, I think the audience had a lot of fun, judging on the enthusiastic reception at the end. Typically for a regional opera company, the set is basic but effectively enhanced by projections and judicious lighting. The traditional costumes from Malabar in Toronto are quite handsome. If one were to quibble, the head dresses of the nuns make them look more Islamic than Catholic. 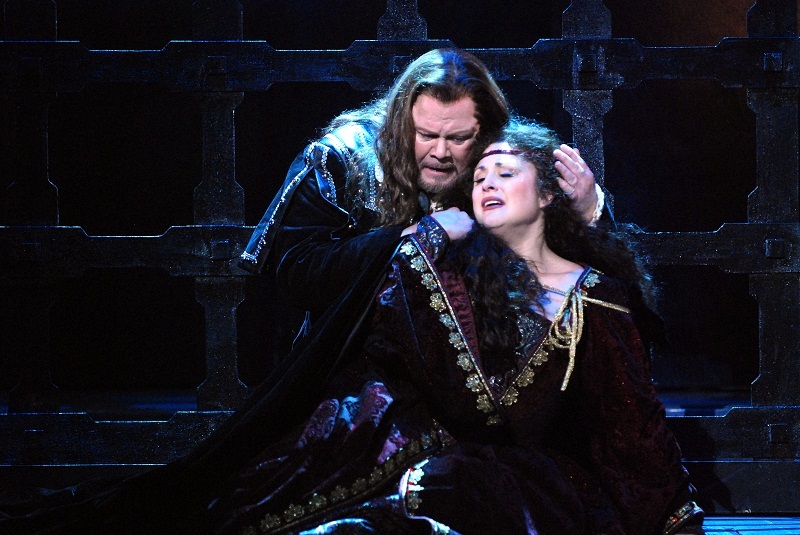 Il Trovatore has gorgeous music and it requires gorgeous voices to bring it off. It partially succeeded on opening night. 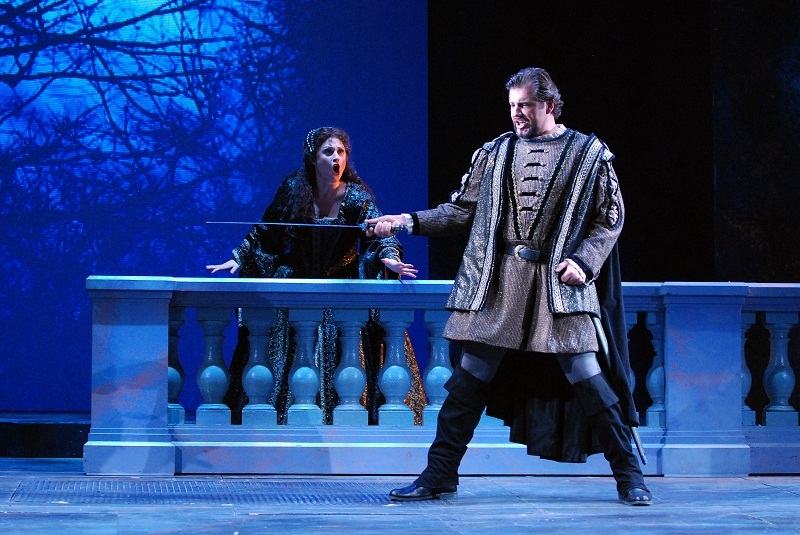 Top vocal honours went to baritone James Westman in his first-ever Count di Luna. He sang with resplendent tone and a particularly generous top, at one point he even threw in a couple of interpolated high notes. Vocally, di Luna suits him like a glove, even if dramatically his wasn't a particularly nuanced portrayal. As Azucena, Bulgarian mezzo Emilia Boteva was certainly up to the task. Her big, gusty and somewhat metallic instrument has what it takes to be an idiomatic Azucena, even if her top notes were a bit wild on opening night. Joni Henson has a big, spinto soprano, with the right vocal weight for Leonora. She sang well except for the top register and some of the coloratura passages in the cabaletta that follows "Tacea la notte placida" and the higher passages of "D'amour sull'ali rose." More suitable for her is Miserere which she sang very nicely. After two decades of singing some of the heaviest roles in the repertoire, Richard Margison's dramatic tenor is showing signs of wear and tear. But he husbanded his resources wisely and sang with a vital sound, only occasionally suffering from a slow vibrato in sustained high passages. David Speers was the ever-considerate conductor in his unswerving support of the soloists. The male chorus sounded a bit threadbare, especially in the more dramatic moments. While this wasn't exactly a Il Trovatore for the ages, it was an entertaining evening in the theatre.